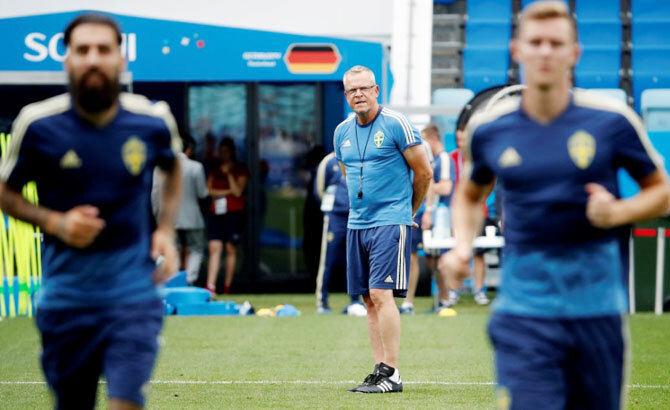 When Zlatan Ibrahimovic and coach Erik Hamren brought their time with the national team to an end after Euro 2016, Sweden turned to Janne Andersson, a man steeped in the country's footballing traditions, to lead them back to the World Cup stage. Ibrahimovic's era in the gold and blue yielded spectacular goals and pithy soundbites but there was little in the way of World Cup success. The Swedes, who came second as hosts in 1958 and third in 1994, missed the 2010 and 2014 tournaments and while they qualified for Euro 2012 and 2016, they limped out at the group stage on both occasions. But Andersson's arrival has helped bring the side back to their roots and they now stand ready for a World Cup last 16 tie against Switzerland on Tuesday. "Why they decided to give me the job is not something I can answer, but I have long experience of Swedish leadership, I come from that movement," he told Reuters in Stockholm before the tournament began. Like many of his predecessors, the 55-year-old has served his time in the Swedish game, keeping the books for small clubs and washing football kit before making the long journey to the country's most prestigious coaching job. A well-respected figure in the game, Andersson's stock rocketed when he guided IFK Norrkoping to a surprise title win in 2015, capturing the championship from under the noses of the mighty Malmo FF. Andersson says there is a lot more to his management style than tradition and he sees things his own way. "I've looked outside of that. The starting point was being a normal safe, Swedish football employee, and from there I have developed and found my own way of looking at things," he explained. "How Swedish or un-Swedish that is, or whether we have gone back to that kind of thing? I hope it has moved forward, in any case." The difference under Andersson could not be more obvious. While Hamren's teams had to accommodate the ego and undoubted talent of Ibrahimovic, Andersson's sides are built on the collective. "The foundation for me is in how we should behave towards each other and how the group dynamic should work, the culture we should have together, I'm very clear about that. There's nothing complicated in it," he said. "You start off outside the pitch and decide on a culture, and then you can take it out on the field. You show great respect for one another, we are there for each other and we work for each other." The well-drilled, counter-attacking Swedes have been labelled boring by some but Andersson is capable of making adjustments to suit the challenge in front of him, as evidenced by the free-flowing football played by his Norrkoping side. "My ultimate task is, with the players that are available, to find a way to play that suits them and gives us the biggest chance of achieving success," he told reporters at the team's Black Sea base. A victory over the Swiss and a place in the quarter-finals would certainly do that.